Raise your hand if you have made a visit to the drive-through at the bank or passed through Mickey D’s with your faithful canine companion perched on the arm rest, balancing somewhere between calm and crazed, in anticipation of a bank biscuit or a salty French fry. And, by the time the transaction has been completed, you have been trampled in the excitement, or are managing a drool situation with a fist-full of napkins. As much as our dogs love us, and we know they do, a strong case can be made that dogs love food even more, and smart restaurateurs across the Lowcountry are doing what it takes to make them welcome. Nearly without exception, if a local restaurant has a deck, patio, or well-manicured (or even less-than-well-manicured) lawn, dogs will be welcomed with at the least a bowl of water to quench their thirst, and at the most, with a menu catering to their tastes and digestive systems. Biscuits … aka cookies … are often found in the pockets of waitstaff and hosts, and if they’re lucky, like the pups who visit the patio at Holy Tequila on Hilton Head Island, they are treated to goodies from Tail Wiggles, the pet supply store in Village at Wexford that stocks a splendid assortment of homemade cookies and treats. 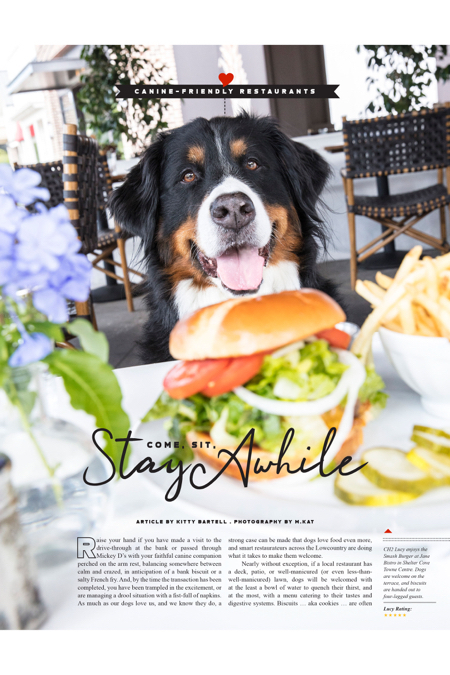 It is unlikely that any of the local four-legged, furry set has visited more restaurant decks and patios on Hilton Head Island and in Bluffton than CH2/CB2 magazine’s own Lucille Rosita Gonzalez Washo, a Bernese Mountain Dog. The ever-faithful guardian of all things CH2/CB2, she has an enviable social life, making restaurant visits on a nearly daily basis with her person, Maggie Washo, editor-in-chief of the magazine, and devoted caretaker, roommate, and companion to the locally famous Lucy. 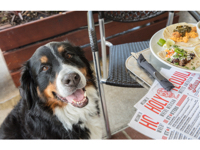 Holy Tequila is dog-friendly on their patio, where CH2 Lucy is a frequent patron. Her favorites include the fried chicken taco, the chicken nachos, and the Queso Fundido. Assisi and his human, Vince Scott, are frequent visitors to Palmetto Bay Sunrise Café. To make it a pleasurable experience for everyone involved, dining alfresco with your pet requires a caveat or two. First … safety. Paying attention to what your dog is doing while you’re eating, drinking, and socializing, could be critical to their physical well-being. There may be surrounding plants and shrubbery that are poisonous to four-legged guests, including, lilies, azaleas, liriope, oleander, elephant ears, and asparagus ferns—all plants readily found in the Lowcountry. Despite having highly touted animal instincts, dogs tend to not have a clue when it comes to what is safe and healthy to chew on while waiting for their cheeseburger or sweet potato chips to arrive. Caveat number two is related to personal space and your pet’s social skills. Maintaining reasonable boundaries and having control of your dog is not only required by law, but is the path to making friends and being invited back. Not everyone likes dogs … yikes! Keeping your canine companion on a close leash and training him or her to lie quietly under your table or to sit close to you makes for happy pets and happy table neighbors. Kirty Smith, Hilton Head Island resident and hostess at Rock Fish Seafood & Steaks at Bomboras, visited the restaurant’s outdoor dining porch with her Standard Poodle, Rhiley many times before joining their team. 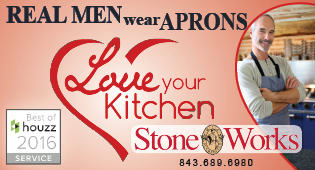 “He’s awesome and loves the Rock Fish porch,” she said. “I’ve always wanted to take Rhiley everywhere with me. He makes me feel a lot more comfortable; he’s really protective, and he’s nice to everyone.” Smith has also taken Rhiley to Frosty Frog in Coligny Plaza, where dogs are also welcome. 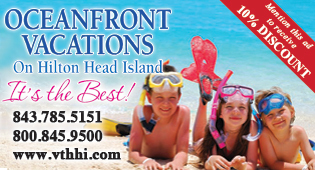 In addition to the water and treats available at so many of the area’s restaurants, Smith said that making new friends happens all the time whenever Rhiley comes along. Raise your hand if dining with your favorite canine in tow sounds good. 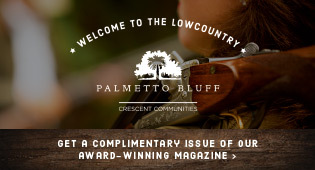 The website, bringfido.com lists over 100 dog-friendly restaurants across the Lowcountry, from the porches at The Cottage and The Dispensary in Old Town Bluffton, to Black Marlin in Palmetto Bay and Old Oyster Factory on the island, restaurant owners and managers understand the connections and affection between dogs and their people. So much better than drive-through paw prints in your lap or drool on your shoulder. Come, sit, and stay a while. 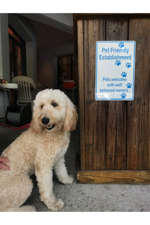 Pets welcome on the patio or outdoor area. Please call to check before bringing Fido, pet policies sometimes change. 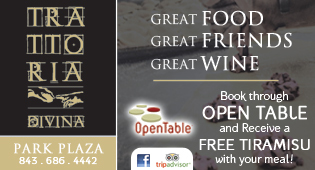 Are you a pet-friendly restaurant we missed? Let us know you welcome four-legged friends and we will add you to the online listing of this article on our website.